Face to face interaction is vital to social learning, however detailed interactive models which capture the richness and subtlety of human expression do not currently exist. Our research aims to start to tackle the complexity of interactive expressive facial behaviours involved in social interaction and learning using a bottom up – top down approach, through the use of generative low level neurobiological models which are modulated by higher level neural system models. To do this we are developing a general simulation framework and modeling language for the integration of established and emerging practical models from the computational neuroscience literature with interactive computer graphics animation. An example of the approach we are taking is embodied in BabyX, an experimental computer generated psychobiological simulation of an infant combining models of the facial motor system and theoretical computational models of basic neural systems involved in interactive behaviour and learning. Exploring the fundamental mechanisms of early communication will lay the groundwork for human computer interfaces of the future. Academy Award winner Mark Sagar is the director of the Laboratory for Animate Technologies at the Auckland Bioengineering Institute. Mark’s laboratory is pioneering neurobehavioral animation combining biologically based models of faces and neural systems to create live interactive systems. Mark previously worked as the Special Projects Supervisor at Weta Digital and Sony Pictures Imageworks and developed technology for the digital characters in blockbusters such Avatar, King Kong, and Spiderman 2. His pioneering work in computer-generated faces was recognized with two consecutive Scientific and Engineering Oscars in 2010 and 2011. Associate Professor Sagar is a recipient of the University of Auckland’s 2012 Distinguished Alumni Award. Data is compelling, seducing us to believe that analysis will always empower us. But this is often not true. Particularly, when events are rare or predictions are poor. This talk considers what to do when confronted with failures with current data or analysis. What can we do ..
when current predictions for rare events are poor? Instead of focusing on rare event classification, for example, suicide prediction, we focus on identifying the riskiest events with minimal error. Such events are likely precursors to outliers of interest. We demonstrate our results through outlier detection in surveillance (leading to our start-up company iCetana, Australia) and in suicide risk prediction (implemented in in Barwon Health, Geelong, Australia). We discuss the challenges in data modeling, pitfalls and our outcomes. when data has special characteristics? We predict cancer toxicity risk, and show how we leverage the special characteristics of the data to build better predictive models. We share our insights we have learnt in our path from such data to models. Our work examines new sensors as they emerge. Our current focus is to monitor people after through social media in the wild. We track mental health and mood stability of users, and detect deviations from norm. We report results in our joint work with the Black Dog Institute, Australia. Svetha Venkatesh is Alfred Deakin Professor and Director of Centre for Pattern Recognition and Data Analytics( PRaDA) at Deakin University, Australia. She has developed frontier technologies in large-scale pattern recognition which is reflected by full patents (3) and publications (488) as well highly novel outcomes, that include 3 start-up companies (Icetana.com, Virtual observer.com, iHosp) and a significant product (TOBY). Her current research interests are in large scale data mining problems in diverse domains including healthcare and in developing the new science of lean data. She was elected a Fellow of the International Association of Pattern Recognition in 2004 for contributions to formulation and extraction of semantics in multimedia data. She is a Fellow of the Australian Academy of Technological Sciences and Engineering. We describe our experiences developing a system (EMBERS) to forecast significant societal events – such as protests, disease outbreaks, elections, domestic political crises – using a multitude of open source data feeds. Over the past three years, EMBERS has successfully forecast many international (and rare) events such as the “Brazilian Spring” (June 2013), Hantavirus outbreaks in Argentina and Chile (2013), student-led protests in Venezuela (Feb 2014), protests stemming from the kidnappings and killings of student-teachers in Mexico (Sep- Oct 2014), and protests in Paraguay (Feb 2015) against a new public-private partnership law. The system also correctly forecast the winners of presidential elections in Panama and Colombia, even as every major poll indicated other candidates would come out on top. We outline some of the lessons learned in operating a large-scale forecasting system, especially as pertaining to system architecture, model evaluation, and continual improvement to changing societal dynamics. Naren Ramakrishnan is the Thomas L. Phillips Professor of Engineering at Virginia Tech. He directs the Discovery Analytics Center, a university-wide effort that brings together researchers from computer science, statistics, mathematics, and electrical and computer engineering to tackle knowledge discovery problems in important areas of national interest. His work has been featured in the Wall Street Journal, Newsweek, Smithsonian Magazine, PBS/NoVA Next, Chronicle of Higher Education, and Popular Science, among other venues. 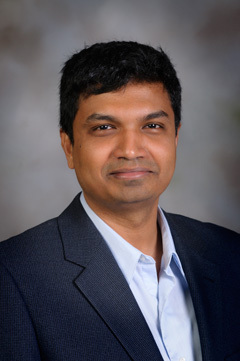 Ramakrishnan serves on the editorial boards of IEEE Computer, ACM Transactions on Knowledge Discovery from Data, Data Mining and Knowledge Discovery, IEEE Transactions on Knowledge and Data Engineering, and other journals. He received his PhD in Computer Sciences from Purdue University.